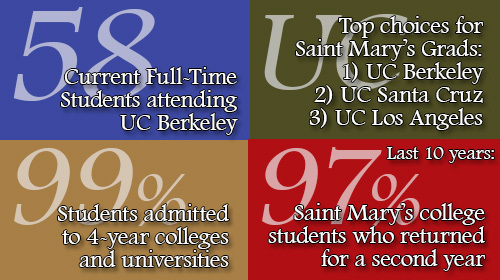 PROFILE: Saint Mary’s is a Lasallian Catholic college preparatory high school located on a beautiful13- acre site in North Berkeley. The Western Association of Schools and Colleges and the Western Catholic Education Association accredited the school through 2022. Saint Mary’s educates its students through its comprehensive academic and co-curricular programs that support and encourage spiritual, intellectual, physical, and emotional growth. The school purposely cultivates an inclusive community representing various social, ethnic, religious, and economic backgrounds. PHILOSOPHY: Saint Mary’s Mission embodies the tradition and heritage of the De La Salle Christian Brothers and their founder, Saint John Baptist de La Salle, to ensure a quality education for all students with an emphasis on the poor and the working class. The hallmarks of a Lasallian education are: Faith in the Presence of God, Quality Education, Respect, Inclusive Community, and Concern for the Poor and Social Justice. Saint Mary’s believes that we must teach and prepare our students to learn about and participate in the world, which they will enter when they graduate. We also know that our students must be able to adapt and evolve to be part of a world that is rapidly changing. The traditional educational model, developed almost a century ago, had to be adapted and altered to meet the future needs of a global society. Saint Mary’s programs prepare students to be life- long learners emphasizing the importance of faith, values, service to others, and a strong sense of tradition and community. CURRICULUM: Saint Mary’s teaches students to become agents of their own learning by introducing them to researched supported learning strategies with an emphasis on the ability to read, think, analyze, and write critically. Students are encouraged to explore their world by engaging in intellectual and moral inquiry. Saint Mary’s offers a comprehensive college preparatory curriculum that exceeds University of California and State requirements. The academic program includes a full offering of Visual and Performing Arts courses, Honors and Advanced Placement (AP) courses, and a variety of electives. We also complement our academic program with the following co-curricular programs that are inspired by the Lasallian Mission. These programs include: Freshman Experience, Enrichment Week, Lasallian Days (Alumni and teacher directed), and Social and Emotional Learning Groups (SEL). TUITION ASSISTANCE: Saint Mary’s tuition assistance is need-based. Saint Mary’s does not offer academic or merit based scholarships. Details are available at www.saintmaryschs.org. ADMISSIONS INFORMATION: Our online application is available at “Apply to Saint Mary’s” on our website, www.saintmaryschs.org. If you would like to be on our mailing list, please go to our website under the Admissions tab, click “Join Email List,” and complete the information required. Remember that the most up-to-date information about Saint Mary’s and our Open House (Sunday, December 2, 2018 at 1:00 p.m.) is on our website at www.saintmaryschs.org.